“A decision on whether to bring grizzly bears back to the North Cascades won’t be made as soon as planned. “Efforts to restore the predators to their former habitat are on hold indefinitely, according to Jack Oelfke, the chief of natural and cultural resources at North Cascades National Park. Along with others, he’s waiting for additional instructions from the Department of Interior and the two lead agencies on the project, the National Park Service and U.S. Fish and Wildlife Service. “Work to restore grizzly bears to the North Cascades Ecosystem has been stopped by Interior Secretary Ryan Zinke’s office, a national parks official told a Montana newspaper. “But Zinke spokeswoman Heather Swift told The Associated Press Tuesday that Zinke did not direct a stop work order on the environmental review. Swift didn’t provide further details. “North Cascades National Park Superintendent Karen Taylor-Goodrich told the Interagency Grizzly Bear Committee last week that her staff had been asked to halt work on its environmental review, the Missoulian reported. “She said the order also stalls discussions with Canadian wildlife managers who oversee a similar grizzly recovery process in British Columbia. The two links below provide information on the proposed importation of grizzly bears into the North Cascades. http://stehekinheritage.com/wp-content/uploads/2018/01/Grizzly-with-Ribbon-1.jpg 211 410 liz http://stehekinheritage.com/wp-content/uploads/2017/09/logo-super-large.png liz2018-03-12 21:19:362018-03-27 14:57:47Grizzly Bear Importation Halted! Friday, April 28th, was the last day to submit responses to the Grizzly Bear Draft Environmental Impact Statement (DEIS). Stehekin Heritage thanks all who used the “Grizzly Bear Information Library” and sent letters responding to the grizzly Draft Environmental Impact Statement (DEIS). For many reasons, we supported Alternative A, the “no action” alternative. Overall, the DEIS needs to be rewritten. The DEIS has not adequately addressed the impact of the proposed helicoptering of grizzlies into the North Cascades Ecosystem (NCE) upon wildlife, visitors, or the surrounding communities. Those reading the DEIS are offered vacuous wordiness rather than reasoned analysis. One brief example of the inadequacy of the DEIS: Answering the question of the probable effects of introducing grizzlies into the North Cascades on visitor use numbers, the DEIS offered this guidance (paraphrased) – those who would like to encounter grizzlies will benefit from the introduction of grizzlies, while those who do not wish to encounter grizzlies may not visit. There you have it. How’s that for precise analysis? To select alternatives B, C or D based on the current analysis presented in the DEIS would be a travesty. Why? Because the current DEIS lacks any semblance of discerning analysis. Imprecise analysis is inexcusable when considering a decision of such import. Stehekin Heritage intends to keep readers appraised of upcoming developments concerning the DEIS. Again, thanks to all who responded to the grizzly DEIS. **April 28th, 2017 was the final day to respond to the Draft Environmental Impact Statement concerning the appropriateness of helicoptering grizzly bears into the North Cascades. The issue of Grizzly Bear Introduction to our area is pending as we await the decision after review of public comment by the NPS. 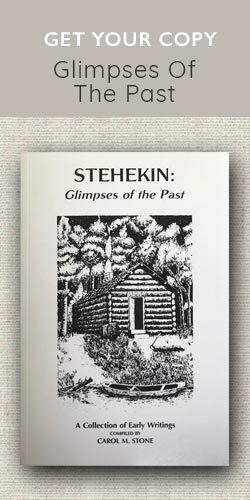 The following is part of the work Stehekin Heritage compiled and gathered during the comment period. The following letters are presented to give a glimpse into the responses generated to the Grizzly Bear Reintroduction Draft Environmental Impact Statement. The deadline to respond is April 28, 2017. 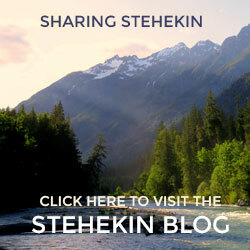 Please consider letting your voice be heard in this important issue that will potentially affect the future of Stehekin and the Lake Chelan Recreation Area for years to come. Please consider writing a letter before the response deadline on April 28, 2017. In 2015, some Washington State Legislators, as representatives of the citizens of Washington who will be most impacted by the outcomes of such action, drafted a letter regarding Grizzly Bear Reintroduction. The letter is concise and compelling, but has apparently been ignored. This letter was written by a Chelan business owner, and Stehekin property owner. Many good points are addressed, and it is a good model to follow for submitting a response to the NPS. This letter was written by a Biological Scientist (retired). This letter is written by the Wallowa County Board of Commissioners – State of Oregon. Well researched and presented. *First, we are asking people to support “Alternative A” the “No Action” alternative of the Draft Environmental Impact Statement (DEIS) . Please write letters before the deadline of March 14, 2017. Action Item: Considering the weakness of the Draft Environmental Impact Statement (DEIS) analysis, it is highly recommend that the decision makers review the contract provisions and require the contractor to prepare a new DEIS that meets basic National Environmental Policy Act (NEPA) standards. Action Item: The time line for citizen response should be extended significantly in order that respondents are able to review habitat data referenced in the DEIS. Action Item: The community of Stehekin MUST be represented on all DEIS maps and included with the twenty-six other gateway communities identified in the DEIS. Action Item: The Grizzly DEIS must not be finalized until a survey of North Cascade visitors is developed that objectively evaluates visitor perceptions concerning the importation of grizzlies into the North Cascades Complex and recreational experiences. Action Item: Because it is the duty of NEPA to make the potential effects of an alternative clear, the grizzly DEIS must actually provide impact statements that are more than vague generalities of no impact upon wildlife and visitors. Why: Because the grizzly DEIS suffers from vacuous analysis far too generalized to be considered scientific, the current DEIS requires significant revision. Until more precise data is included in a revised draft, public input will lack precision envisioned when (National Environmental Policy Act) NEPA and the EIS process were conceived and, unintentionally, set grizzlies up for failure in the North Cascades. The following are required action items to be accomplished before the grizzly DEIS is remotely responsive to legally established NEPA guidelines. A map that plots, to the greatest degree of accuracy possible, the location of bear sightings confirmed in the Sullivan Report included in the body of the DEIS. A map showing the locations of the three trading posts (Thompson, Colville, Walla Walla) in relation to the North Cascades is needed to be included in a DEIS revision and made available to those reviewing the Grizzly DEIS. –B.1 The grizzly DEIS cannot not be finalized until ungulate (deer, elk, moose, caribou, mountain goat, bighorn sheep) population estimates throughout the North Cascade Ecosystem (NCE) are mapped and used to inform the DEIS narrative concerning the effects of grizzlies on ungulate populations. 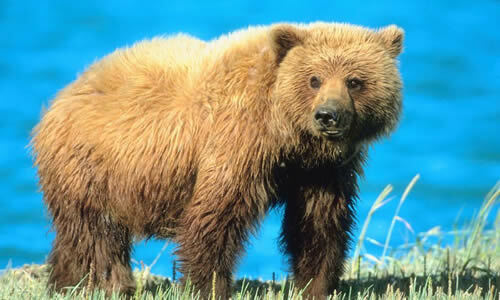 –B.2 Action Item: Because it is the duty of NEPA to make the potential effects of an alternative clear, the grizzly DEIS must be required to actually make that evaluation and provide it to the public for review before the DEIS is finalized. It’s understood that individual grizzly bear territory will overlap, however, they will not overlap completely. As with ungulates, grizzly distribution will not be uniform over the entire NCE. –D. Action Item: The Grizzly DEIS must not be finalized until a survey of North Cascade visitors is developed that objectively evaluates visitor perceptions concerning the importation of grizzlies into the North Cascades Complex and recreational experiences. –E. 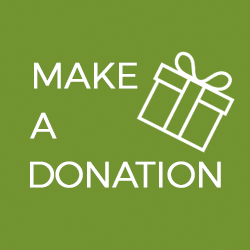 Action Item – The time line for citizen response should be extended significantly in order that respondents are able to review habitat data referenced in the DEIS. –F. Action Item: The legislative history section of the DEIS must both include relevant legislative history references attesting to the fact that the enactment of PL 90-544 ensured that in the North Cascades Complex recreational values be given priority over all other uses. –G. Action Item: The community of Stehekin must be represented on all DEIS maps and included with the twenty-six other gateway communities identified in the DEIS. –H. Action Item Because it is the duty of NEPA to make the potential effects of an alternative clear, the grizzly DEIS must actually provide impact statements that are more than vague generalities of no impact upon wildlife and visitors. –I. Action Item: Considering the weakness of the DEIS analysis, it is highly recommend that the decision makers review the contract provisions and require the contractor to prepare a new DEIS that meets basic NEPA standards. 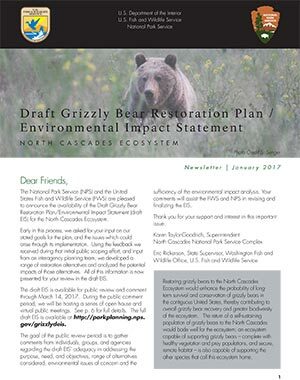 The following document is a copy of the Draft Grizzly Bear Restoration Plan / Environmental Impact Statement. “The National Park Service (NPS) and the United States Fish and Wildlife Service (FWS) are pleased to announce the availability of the Draft Grizzly Bear Restoration Plan/Environmental Impact Statement (draft EIS) for the North Cascades Ecosystem…..